Do you ever have a day where you don’t think you’re going to post anything and then after about 30 minutes you have 4 different posts half written in your head and can’t decide which to post or how to space them all out over the day so your followers don’t think that you’re spamming them? I was going to give an update on my life in the online dating game thus far, but its only been 48 hours (and already have stories!) and I think too many updates will get annoying. I think I’ll just keep a draft going and post after a week. But right now, I want to talk about The Twilight Saga. I want to preface this by saying that I never have, and probably never will, read the books or watch the movies. All my knowledge on Twilight is from what other people have said or things I have read online. Not exactly the most reliable resources, I know. Now, I’m sorry, but can anyone tell me the appeal of this series? Like I find the whole idea a little strange if you ask me (but then I totally adore Harry Potter so who am I to judge?!) 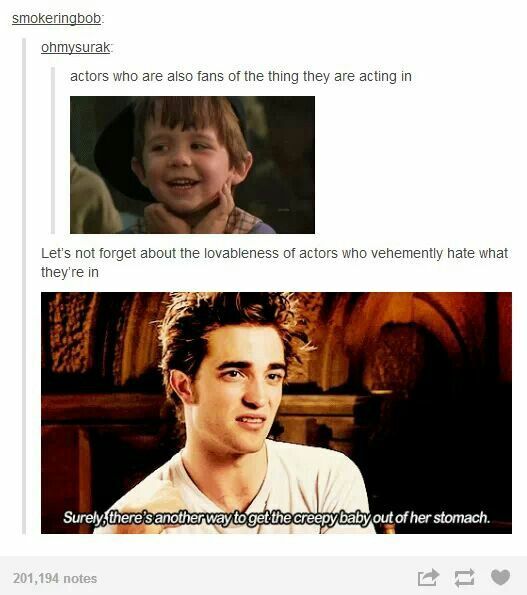 but when the main actors are so openly against it, can it really be that good?! 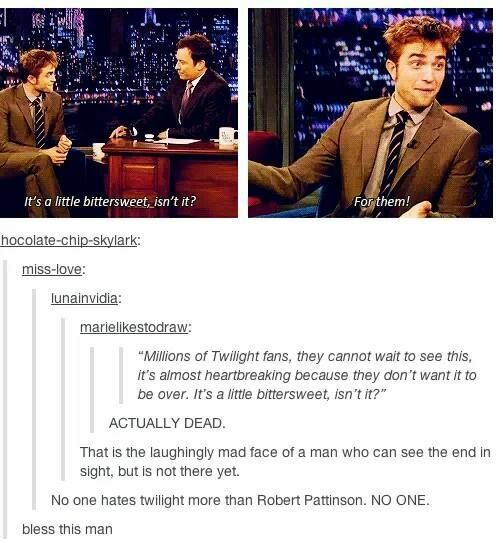 I can’t help… I’ve never seen any of the Twilight movies nor read the books either…! Nope, I can’t help either… but I think it’s the classic appeal of chivalry and bad boy saves the day? IDK, I think that’s what I’ve heard. I told myself I would never read Twilight. I was very stern with myself! And then I had zero reading material for my roadtrip (forgot to pack it) and ugh… stopped at Walmart on the way and there it was, staring me in the face. I read it. Got sucked in to the whole series and then hated myself for the rest of my existence. It’s different, I’ll give you that. Also, Glue, Moody? Really? Glue? Lol! lol it made you hate yourself? that’s so sad!! 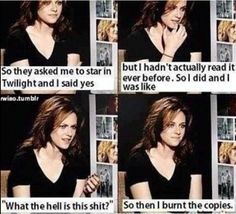 I’ve read the entire Twilight series (once, I don’t have copies of it like I do the HP series, so can’t read it over and over again) and have seen the movies many times (DVD set, plus TV) and love them both. What I hated about the movies is that they leave stuff out that really should have been put in for some of what happens to make sense. Like the whole thing with Mike and Bella. In the books he has a serious crush on her, even though he knows she’s only interested in Edward. Unlike Jacob, he’s okay with this, and is happy just being her friend, and doesn’t try to get her to fall for him every five minutes (that is so annoying about Jacob, which naturally you see way more of in the books than the movies, but still…I was so glad when he finally imprinted on Renesmee, and gave her poor mom a break). And Jessica’s jealousy is covered better in the books…it’s not made a big deal of, but you do see her gradually become jealous of Bella, not because of anything Bella does but because Jessica and Mike become an off and on item (explaining the part in the movie where they’re at the wedding and she makes a snarky comment about Mike drooling when he sees Bella in her dress), and I think the reason they break up so much is because he keeps comparing her to Bella (not out loud or anything, but he’s still not over his crush so naturally he keeps wondering why Jessica’s not measuring up) and they fight about it, break up for a while, get back together, break up…you know, the whole teenage angst thing. 😛 And Jessica knows that’s what’s going on with Mike and is tired of it, but can’t seem to walk away permanently. In the third movie a reference is made by Jacob to the fact that because he’s the chief’s son, he’s the natural alpha for their pack, but he didn’t want the job so let Sam have it. And that’s basically where they leave it in the movies, till he faces off against Sam and most of the pack when protecting Bella and Renesmee in Breaking Dawn Part 1, and Jacob makes it clear he’s not going to do what Sam says, and takes off on his own. In the books of course, more detail, but you also see Seth and Lea leave with Jacob after the confrontation, and travel with him and become their own pack, until they eventually reunite with the main pack, at which point Sam and Jacob share alpha duties. And naturally there’s more information in the books about imprinting, and when Jacob imprints on Renesmee you get to see how that affects him, and then when she’s like four days old and Bella finds out he imprinted on her newborn daughter she goes off on him at first (and it is HILARIOUS! ), until Edward is finally able to calm her down. So many little scenes like those get left out, and while they may not be super important to move the story along, it’s just like all the stuff that got left out of the HP movies: If you haven’t read the books, you’re only getting a fraction of the story, and missing out on so much. lol you have put forth a very well researched opinion! Very interesting! there are only a few books that I can read over and over again. I have to admit that most of them are children’s books haha! Dr. Seuss for the win! I feel much the same about Dr. Seuss. I read the books and watched the movies (don’t tell anyone hehe). A teacher friend said it was good YA lit, and being an English major/former teacher, I wanted to read them. 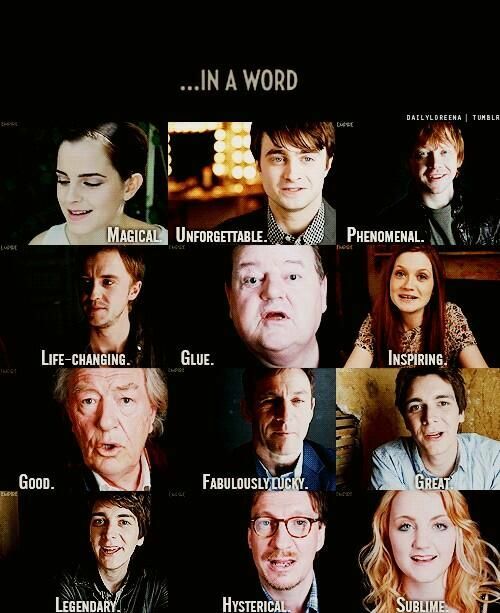 I couldn’t tell you why I read any beyond the first book, let alone why I watched the movies. I wouldn’t go near it now!